Lo Tishkach arranges all travel logistics and distributes questionnaires to participants about burial sites that are visited. Through completed questionnaires, Lo Tishkach assembles information about the size and condition of the burial grounds, maintenance, number and conditions of gravestones or other markers, current use of the site, restorative work needed, and history of the local Jewish community. In the case of execution sites during the Holocaust, information is sought regarding the number of victims and the circumstances of their murder. Expedition members are expected to undertake physical labor in cleaning sites. In addition to local people, Ms. Yanover said that Lo Tishkach is open to organizing expeditions for foreigners. In July, she continued, Lo Tishkach expects to host about 30 English-speaking young people in a pilot project; participants will meet in Lviv and proceed from there to Transcarpathia, formerly a part of the Austria-Hungarian Empire. About 270 Jewish burial grounds are known to exist in this mountainous region. Preparatory seminars are being held through Skype technology, Ms. Yanover explained. The catalogue includes at least one page for each of 52 Jewish burial grounds in the Kyiv region. 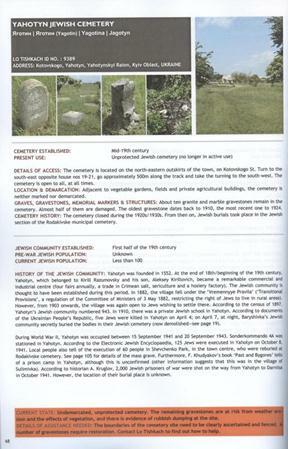 The page about Yahotyn Jewish Cemetery (right) describes its history and notes that it is no longer in active use. Jews now are buried in a section of a municipal cemetery. Fewer than 100 Jews remain in Yahotyn today, said the description. In response to a question, Ms Yanover said that the total Lo Tishkach budget for Ukraine in 2010-2011 (September to September) is $80,000, excluding her salary and certain special projects. Her office is awaiting news on several grants for which they have applied. 69. 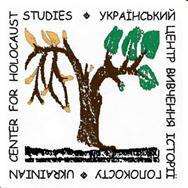 The Ukrainian Center for Holocaust Studies was established in 2002 as a non-government organization in partnership with the Institute of Political and Ethnic Studies of the National Academy of Sciences of Ukraine. It maintains a small office in a building of the National Academy of Sciences in Kyiv. Its staff consists of five local individuals along with an Austrian volunteer. The writer spoke with Anatoly Podolsky, director of the Center, during a visit to the organization’s office. Dr. Podolsky stated that the Center works in two areas, Holocaust research and Holocaust education. In the area of research, he continued, the Center organizes several annual study trips to Poland and one to Yad Vashem in Israel. It maintains very good contacts with Poles in relevant positions, he said. The Center publishes a scholarly journal every six months that reports results of research in Poland, Ukraine, and other countries. At the present time, Dr. Podolsky stated, there is great interest in comparing the fates of Jews and Roma who lived in the Carpathian mountain area during the Holocaust. Efforts of the Center in education include various conferences for teachers and pupils, as well as publications suitable for various groups. It encourages research into the Holocaust by high school students. A three-day competition in the topic is held every year in Kyiv, and the most noteworthy papers are published in an anthology. This program is partially financed by grants from the Embassy of the United States, said Dr. Podolsky. The Center’s publishing program is diverse, said Dr. Podolsky. It includes student research, its own research, memoirs of survivors, various official records of the period, and translations of useful materials published abroad. Dr. Podolsky stated that the government of Ukraine provides little political, moral, or financial support for Holocaust studies. The Holocaust is remote to them; they know that the Holocaust occurred in Europe, but somehow Europe does not include Ukraine in this period. They claim that the Holocaust is not central to Ukrainian history. Many Ukrainian Jews are wealthy, government officials say; therefore, the Jews should finance all aspects of Ukrainian Holocaust studies. Primary funders of the Ukrainian Center for Holocaust Studies include The Rothschild Foundation (Hanadiv) Europe, the German Ministry of Foreign Affairs, and the Swedish Holocaust Memorial Association. However, said Dr. Podolsky, support from these and other funding sources remain irregular. Nonetheless, he continued, he remains “optimistic” about the capacity of the Ukrainian Center to continue its work. Dr. Anatoly Podolsky, right, faces continuing financial problems in managing the Ukrainian Center for Holocaust Studies. In response to a question about contemporary antisemitism in Ukraine, Dr. Podolsky said that it is “marginal.” Anti-Jewish stereotypes persist, he continued, and sometimes antisemitic comments are made during political campaigns about Jewish or partly-Jewish candidates; he cited recent elections in Odesa, Kherson, and Uzhgorod as examples. Bigoted commentators are quick to call attention to Jewish family names, Dr. Podolsky observed, and to scapegoat Jewish oligarchs about current economic problems. Nonetheless, he does not perceive antisemitism as a major problem. Many old Jewish cemeteries were destroyed during the Soviet period and subsequently used as sites for construction of various buildings. The Austrian volunteer, a young man, serves as an intern in lieu of military service in Austria. 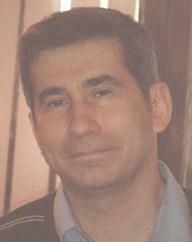 Dr. Podolsky earned his Ph.D. at Bar-Ilan University in Israel. The topic of his dissertation was The Nazi Genocide of Jews in Ukraine (1941-1944). The northernmost location of the Carpathian Mountains is in the border area between Slovakia and Poland. The Carpathian Mountains extend southward through western Ukraine and eastern Romania.